The main equipment of 2t/h olive pomace pellet plant are GX1500 rotary drum dryer, two sets of MZLH420 ring die pellet mills, SKLN1.5 pellet cooler and WDCS-50 pellet weighing and packing machine. 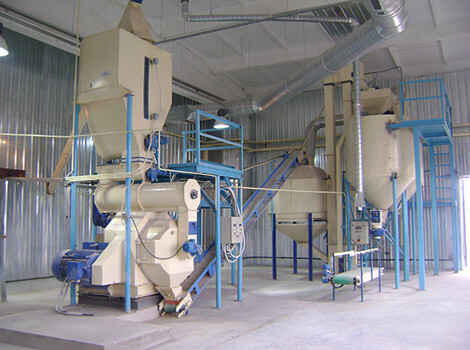 The appropriate moisture of olive pomace for pelletizing is 12-16%. High moisture content could result in easy split pellets, and low moisture could cause pelletizing difficulty problem. Therefore, in order to get superior quality pomace pellets, you should pay more attention to this part. Drum dryer is the best choice for 2t/h olive pomace drying, which is one of the traditional wood drying equipment. Reasonable structure, high efficiency, low energy consumption and convenient for transportation make sawdust dryer stand out among wood materials drying equipment. 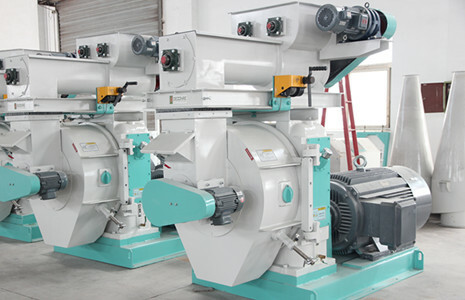 In the 2t/h olive pomace pellet plant, two 420 ring die pellet machine are equipped. 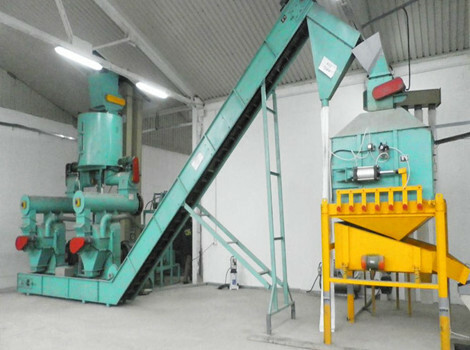 Ring die pellet machine is adopted here to press the olive pomace into solid fuel pellets. After the olive pomace is sent into the feeder, the screw conditioner will mix the materials evenly and then distributes the pomace to pelletizing chamber. The rollers in the chamber press the pomace into holes of ring die to form pellets. Meanwhile, there are several knives on the other side of ring die to cut the pellets into preset length as required. Finally, the pellets will be discharged into a container ready for use. 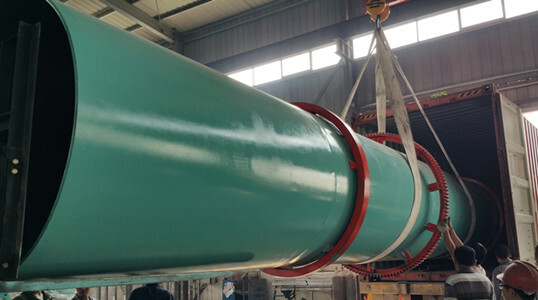 The pellet machine adopts frequency control motor feeding, overload protection device, outside discharging mechanism and pressurized lubrication system. Roller outer diameter 165mm Pellet size 6mm, 8mm, 10mm etc. The pellets from pellet mill are hot and moist. Counter flow pellet cooler is adopt here to reduce the moisture and temperature of olive pomace pellets. The pellets are fed into the cooler through rotating feeder and distributed evenly by taper distributor . The cold air passes through pellets vertically from the bottom to the top, which is opposite to the direction of pellets entering. Cold air contacts with the cooler pellets first, and the becoming warmer air touches warm pellets, which keep the temperature variations between the pellets and the air to a minimum degree. At last, pomace pellets are sucked out by suction system and cooled down. After cooling, the packing process is necessary to protect the pomace pellet from damp and dust. Automatic pellet packing machine is made up of elevator, automatically weighing machine, conveying part, and sealing machine. It is advanced designed and adopt PLC controlling system, high automation in weighing and packing. The pellets can be packed as request from 5-50kg/bag.